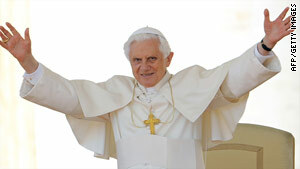 Pope Benedict XVI waves as he arrives in St. Peter's Square last month. Rome, Italy (CNN) -- Pope Benedict XVI will appoint a special envoy to run a Mexican Catholic order whose founder abused minor-age seminarians and fathered three children with two women, the Vatican said Saturday. A Vatican statement said the pope will also appoint a commission to review the constitution of the Legion of Christ. Critics had called for the order to be dissolved and its top leaders forced out, saying that the scandal has done irreparable damage to the religious sect. In late March, the sect revealed the Rev. Marcial Maciel's transgression and asked for forgiveness for the "the reprehensible actions of our founder." In its statement Saturday, the Vatican said, "the conduct of P. Marcial Maciel Degollado has caused a series of consequences on the life and structure of the Legion, such to require a way of deep revision. Video: Delay in defrocking priest? "The very serious and objectively immoral behaviour of P. Maciel, confirmed by incontrovertible accounts sometimes turned into true crimes. They show a life lacking scruples and authentic religious calling. Of this side of life, a great part of the Legionaries were in the dark -- especially given the system of relationship built by P. Maciel, who very skillfully knew how to create alibis, obtain loyalty, trust and silence from those around him and strengthened his own role as charismatic founder." The abuse allegations surfaced in 1997. The Vatican started an investigation into Maciel's actions in 2004 and concluded in May 2006 that he was guilty of sexual abuse, the order said. Law enforcement officials apparently were not informed. The Vatican, taking Maciel's health and age into consideration, asked him to give up public ministry, the group said. Pope Benedict XVI approved the decision. Maciel died two years ago. Although leaders at the Legion of Christ knew of the abuse since May 2006, they kept it quiet until March 2009. Javier Bravo, spokesman for the sect in Mexico and Central America, said Legion leaders did not reveal the accusations sooner because "it has been a very difficult process. We weren't ready to assimilate it before." He later told CNN, "we have to recognize the facts as they are." In addition to sexually assaulting young seminarians, Maciel fathered at least three children, the group said. The priest had a daughter from a stable relationship with a woman, and two men said they are his children from a relationship with another woman. Maciel, born in March 1920, founded the Legion of Christ in January 1941. According to the order, the Legion of Christ has a presence in 24 countries. The first Legionaries arrived in Spain in 1946, and the order established a center in Rome in 1950. In the 1960s, the Legion established itself in Ireland and the United States. In the 1980s, the order expanded into more countries in South America and Central Europe. The Legion says it recently began pastoral projects in Eastern Europe and Philippines. The announcement about Maciel comes against a deepening crisis in the Catholic church, which is investigating complaints of abuse in Ireland, Germany, Britain and several other countries.